The Shimano Stradic FI Spinning Reel has become the performance standard for anglers who are committed to chasing big fish with spinning gear! The venerable Stradic is now fitted with Shimano's Paladin Gear Durability Enhancement and Propulsion Line Management systems, including Aero Wrap II worm gear oscillation and advanced S-Concept balancing, for totally smooth, crisp handling over the long term. Aluminum frame and spool, Fluidrive II; Dyna-Balance; Floating Shaft; Super Stopper II; waterproof drag; maintenance port. Includes a FREE spare aluminum spool. "Got one of the originals. The Stradic is an example of Shimano quality. My reel is a real work horse. Really like the ample line capacity. Great reel." 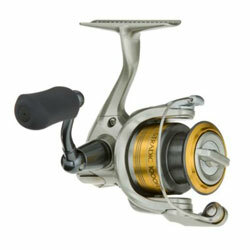 "The new design has brought me back to stradic reels. Very smooth and quiet." "I have an FD model. That is several years old. I have had to have service on it only once."